Iron & Wine is the stage and recording name of folk rock singer and composer Sam Beam (born July 26, 1974). He currently resides in Dripping Springs, Texas, outside Austin. He has released four studio albums, several EPs and singles, as well as a few download-only releases, which include a live album (a recording of his 2005 Bonnaroo performance). The name Iron & Wine is taken from a dietary supplement named "Beef Iron & Wine" that he found in a general store. Beam was raised outside Columbia, South Carolina, United States where his father worked in land management and his mother was a schoolteacher. He graduated from Virginia Commonwealth University with a bachelor's degree and the Florida State University Film School with an MFA degree. 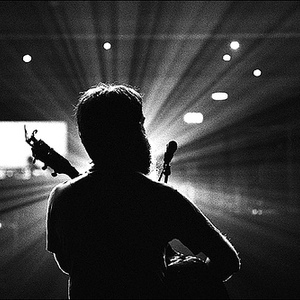 Until the first Iron & Wine album, Beam's main source of income was as a professor of film and cinematography at the University of Miami and Miami International University of Art & Design. He had been writing songs for over seven years before a friend lent him a four-track recorder. His friends handed out copies of demos that he had made, and the owner of Sub Pop Records personally contacted Beam and proposed a deal. Beam released his first album, The Creek Drank the Cradle, on the Sub Pop label in 2002; Beam wrote, performed, recorded, and produced every track on the album by himself at a studio in his home. The album features acoustic guitars, banjo, and slide guitar; its music has been compared, variously, to that of Nick Drake, Simon and Garfunkel, Neil Young, Elliott Smith, and Ralph Stanley. In 2003 The Sea & the Rhythm was released, an EP collecting other home-recorded tracks along the same lines as those on the debut. Beam's second album, Our Endless Numbered Days (2004), was recorded in a professional studio with a significant increase in fidelity. The focus still lies on acoustic material, but the inclusion of other band members gives rise to a very different sound. Beam released an EP titled Woman King in February 2005, and the EP In the Reins, a collaboration with Calexico was released in September 2005. This joint work mostly features new full-band versions of previously recorded Iron and Wine rarities. One of his most famous songs is a cover, which was featured on a commercial for M&M's candies and in the 2004 film ?Garden State? (and on its popular soundtrack), of "Such Great Heights" by The Postal Service. "Kiss Each Other Clean" is the fourth studio album by Iron & Wine, released January 25, 2011. The album's title is taken from the lyrics of track 10, "Your Fake Name Is Good Enough for Me". The album marks a further change in style ? in an interview with SPIN magazine, Beam said ?It's more of a focused pop record. It sounds like the music people heard in their parent's car growing up? that early-to-mid-'70s FM, radio-friendly music."